Week 36: Taper Time! – Where's The Tofu? We made it to taper!! HALLELUJAH! That means we’ve officially peaked and now it’s all about gradually reducing volume while sticking with shorter interval workouts. It’s also equally about rest, recovery, eating well, hydrating, bike maintenance, making crazy detailed lists, and generally trying to avoid freaking out. It’s harder than you think! I went to Washington DC for a friend’s wedding from Friday through Sunday this week so I knew I wasn’t going to be able to get a long bike ride in over there. But my calendar called for a weekend long ride. So what to do!? Skip it? Or wake up at 5:00am and do an extended bike-to-work commute on Thursday morning? The latter, obviously! I joined the SF2G cycling group (stands for “San Francisco to Google”) which brings commuters together to make the 46-mile trek down to Google’s Mountain View office. 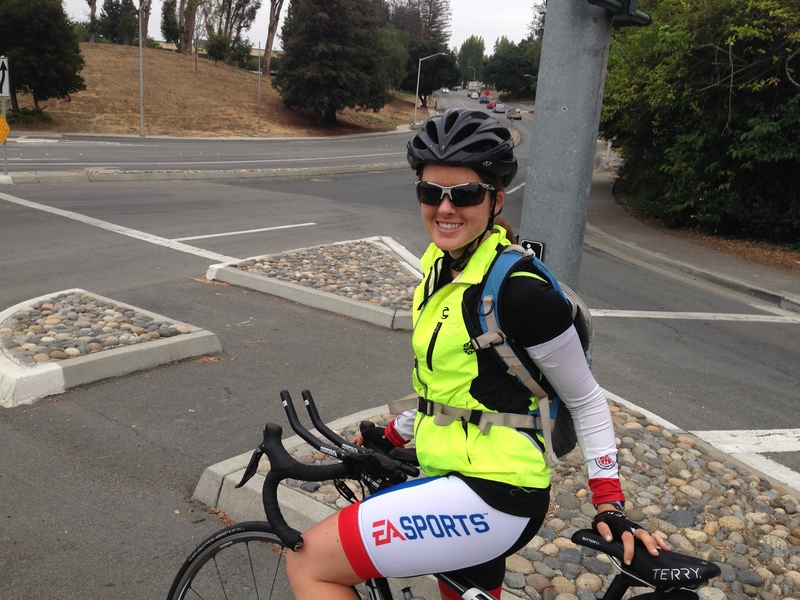 Last summer I rode with them consistently 1-2 times per week to work (~30 miles to Electronic Arts). There are two route options: Bayway (easy and flat) and Skyline (hilly and scenic). I opted for Skyline and met the group at a coffee shop in the Mission before rolling South. I rode with another Michigan grad, Ted, and two other people. We stuck together, chit-chatted, and maintained a pace that got us down to work at a reasonable time. Once I got to Mountain View I hopped on the train with my bike and made it to my office in Redwood Shores! Great morning! Strava Output. Skyline. SF to Mountain View. 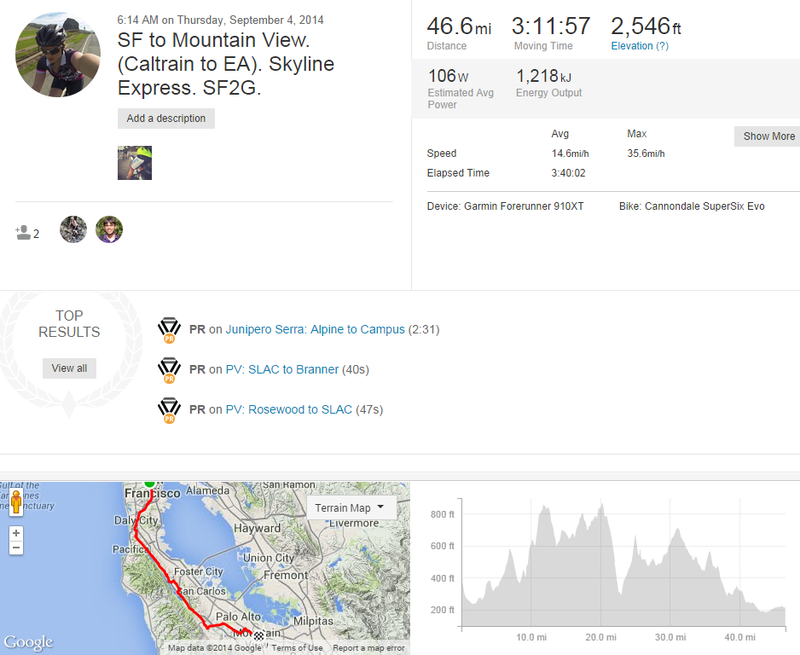 The ride was also a great way to test my knee since I had been having some pain over the last couple weeks. Happy to report that everything is fine! With the SF2G group it’s very common to wear a kit with your corporate logo on it. EA never had their own design so I always felt left out last summer. But recently someone worked up a design and had Castelli kits made. Love it! Commuting to work on your bike has so many benefits: save gas, save money, meet new people, avoid the stresses of traffic, help the environment, get your training/exercise done, and start the day right! 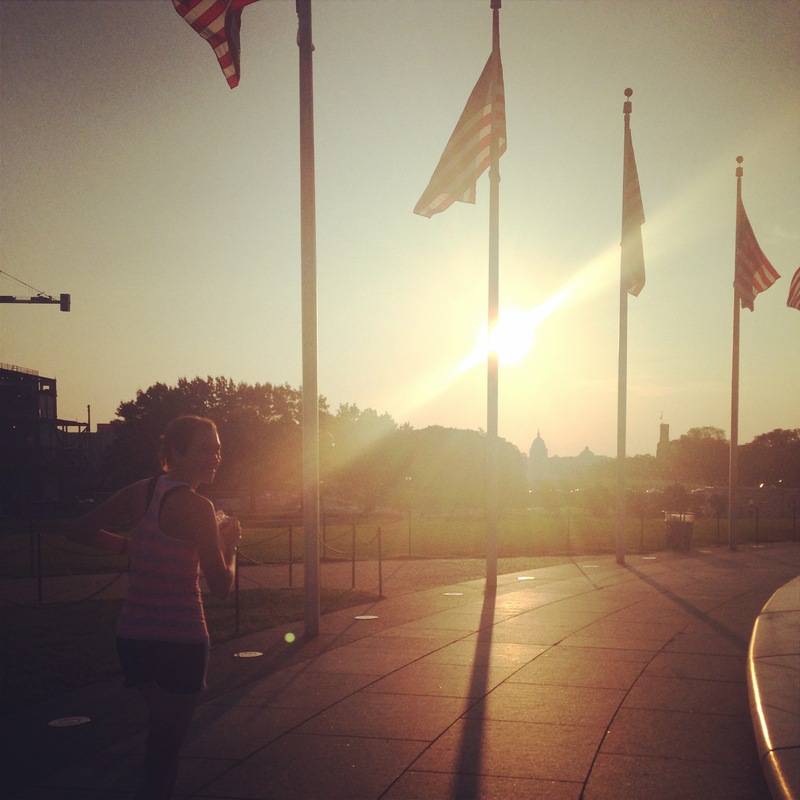 After a long cross-country flight full of cheesy movies, snacks, screaming babies, and compression gear, I made it to Washington DC on Friday evening. I was wearing a very San Francisco outfit and was immediately pummeled by the strength of the heat and humidity. Seriously it almost knocked me over. Luckily pretty much everything indoors was over-air conditioned so I was all set once I got inside. This weekend called for a 2-hour run at marathon pace (I swear we’re tapering…) which I knew was going to be a challenge with the jet lag, heat, humidity, and generally not knowing the area. Luckily I have some pretty great friends. Joey and Robert showed me exactly where I could run and Kellen actually ran with me! Wow, thanks all! Kellen and I were staying together, so we woke up at 5:30am (yeah, 2:30am Pacific time) and vowed to get out the door right when the sun was rising to stay safe but also avoid the hot sun. The run was spectacular. 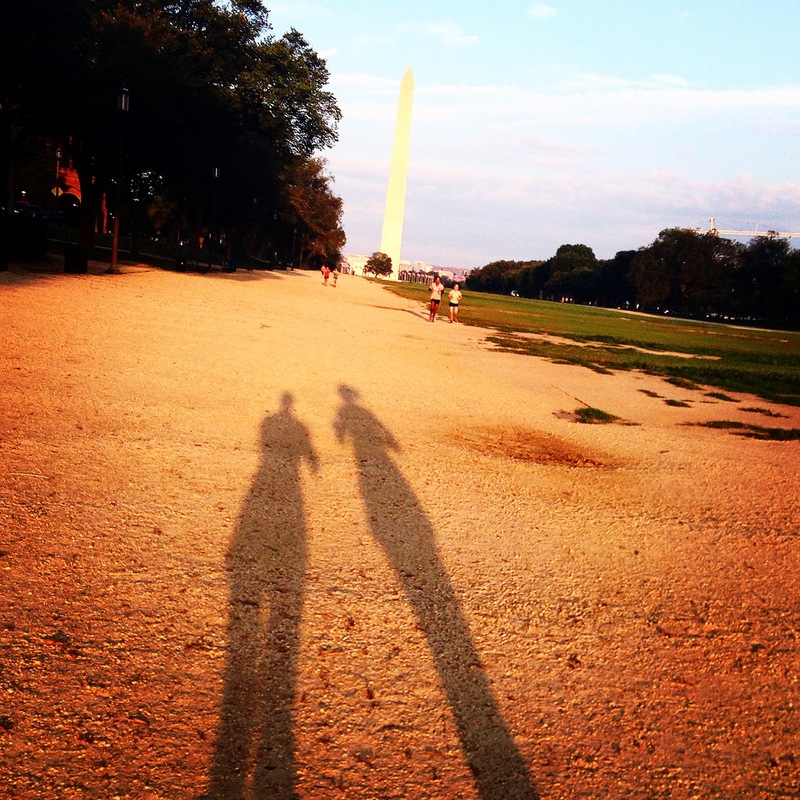 We ran around the National Mall and saw all of the monuments, memorials, and museums, without the herd of tourists. 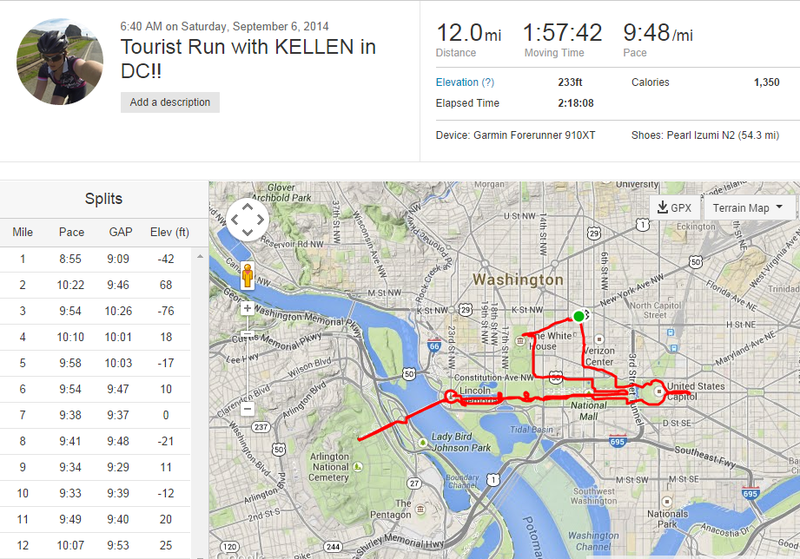 We even ran across the bridge to Arlington National Cemetery and finished near the White House. The only other people outside were police officers, other runners, a tour group of elderly war veterans, and a group of guys doing stair repeats at the Lincoln Memorial. Even though we “only” did 12 miles, it was a pretty tough run in the brutal humidity. I have never sweat so much in my life! Running towards the National Monument. 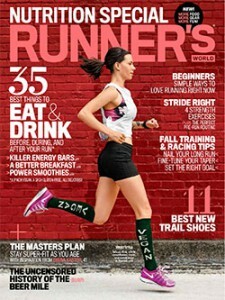 The cover of Runner’s World features a woman, Micah Risk, wearing socks with the word “Vegan” on them! “Being vegan is the best way to fuel my body,” says Risk, who works to educate women on the power of good nutrition through the new startup, Lighter. Self Magazine is filled with vegetarian recipes and articles this month! I couldn’t believe how many there were. They have a new editor but I don’t think she’s vegan or anything. So awesome! San Francisco is considering adding Meatless Monday to its public schools!! Article. 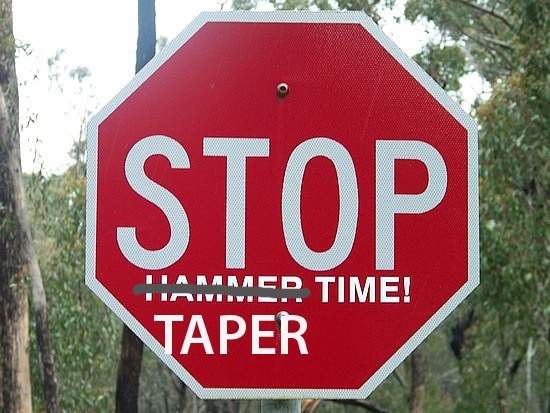 Pingback: Week 37: Taper Time! – Where's The Tofu?